A few years back I took the workshop Mathematics in the PYP in The Netherlands. 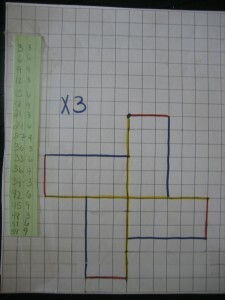 One of the learning experiences I took away and still use today was turning the multiplication tables into spirolaterals. I will share with you the process as well as some student samples. I will use the 3 times table. First list out the times table on paper. Now we are only looking for single digit numbers, so any two digit numbers that appear, you need to add together until you get a single digit. Keep going until you see a repeated pattern. 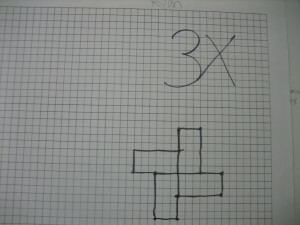 Now I take my number pattern to the graph paper. And so on and so on , UNTIL you get back to your original starting point. This image created is your 3 times table spirolateral. You can add color to it as well. As the students continue they begin to see similarities between certain times tables and you can have them inquire into why that might be. They also begin to think about larger times tables like the 27 times table, and predict based on what they know, what the spirolateral will look like. I have done this with grades 3, 4, and 5. Each time the students truly enjoy the experience and are engaged in their thinking and learning. 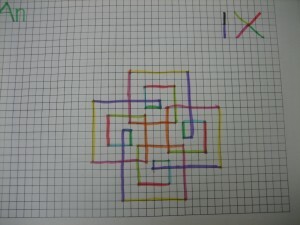 What do you think the 9 times table would look like? Have a go! This entry was posted in art, Math and tagged fun, inquiry, math, multiplication, prior knowledge. Bookmark the permalink. 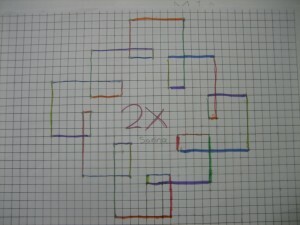 19 Responses to Multiplication Tables as Art?! I LOVE your ideas! If your blog wad a book, I would buy it! Very cool. This looks like something I would even enjoy. Going to get this going today, will let you know what they come up with! Thanks for sharyn. Great! Yes, let me know how it works out. You reminded me…have to check Sharyn’s blog..has great ideas…. That’s great! It makes me want to experiment with different numbers! We are looking at patterns through our CI this will be fantastic. We have also done some great stuff with Fibonacci numbers. I shared it on Twitter and it has been a hit 🙂 ! Hi there,I log on to your blogs named “Multiplication Tables as Art?! | sharynideas.com” regularly.Your story-telling style is awesome, keep it up! And you can look our website about تحميل اغانى شعبى. than that which you may anticipate.